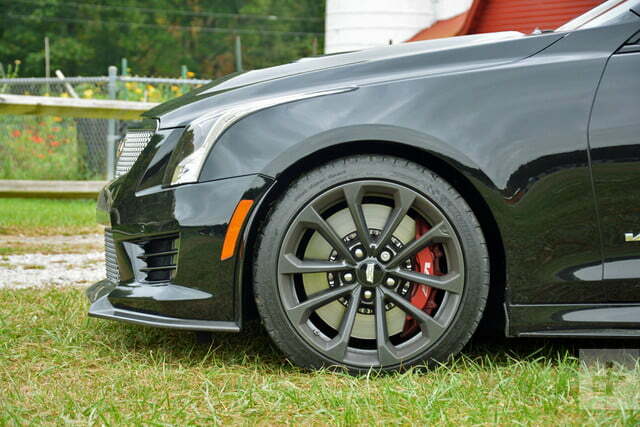 Dapper and precise, the Cadillac ATS-V gives the Germans plenty to worry about. 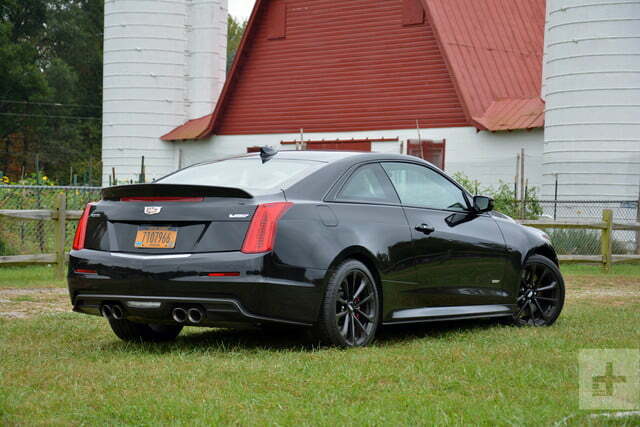 Blacked-out like the Batmobile, our 2017 Cadillac ATS-V Coupe turned more than a few heads on the streets of Manhattan. German tourists glanced as they walked past it, wondering “was is das?” with a curious expression. Busy New Yorkers took a quick break from their restless lives to appreciate how far Cadillac has come since their grandparents owned a Fleetwood in the Hamptons. The ATS-V is a sportier evolution of the ATS, which is a compact model aimed right at Audi’s A4 and A5, the coupe and sedan variants of the Mercedes-Benz C-Class, and BMW’s 3 and 4 Series. To stay at the alphabet soup level of analogy, V competes in the same league as RS, AMG, and M. If you have a big enough bowl of soup and an Italian dictionary you could also spell out “Alfa Romeo Giulia Quadrifoglio” as one of the Cadillac’s competitors. So, what’s all the fuss about? It starts under the hood with a twin-turbocharged, 3.6-liter V6 engine with four valves per cylinder and direct fuel-injection. 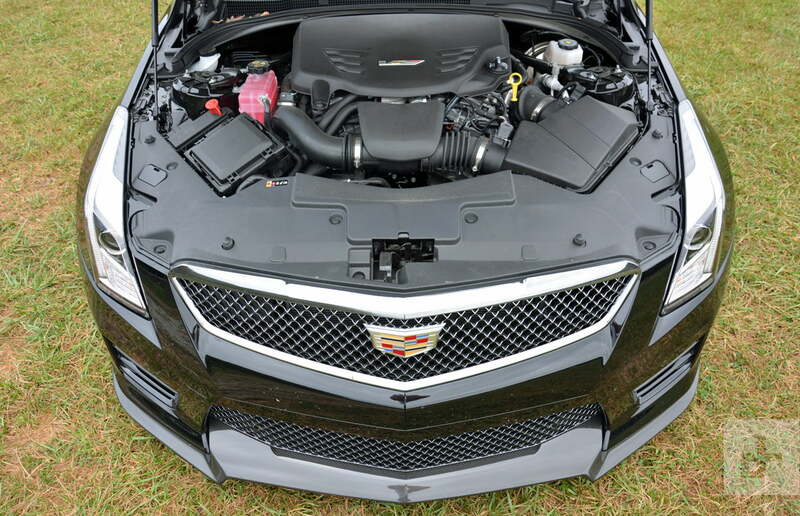 In this application, engineers tuned it to generate 464 horsepower at 5,850 rpm and 445 pound-feet of torque at 3,500 rpm when it burns premium-unleaded, figures that place the ATS-V right in the heart of its segment. The six-cylinder sends its power to the rear wheels via a six-speed manual transmission and an electronic limited-slip differential, though our tester came equipped with the optional paddle-shifted eight-speed automatic. 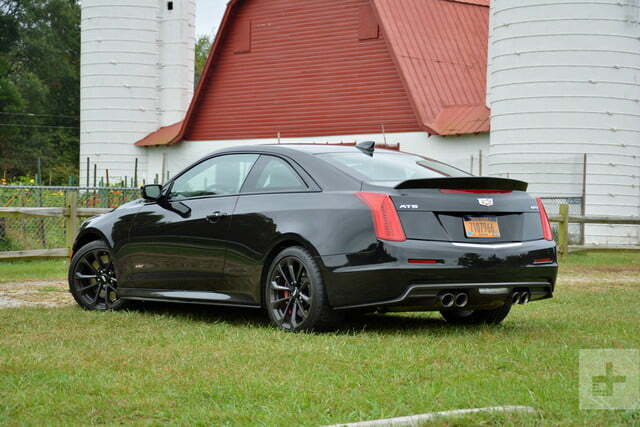 Like the bigger, V8-powered CTS-V, the ATS-V perfectly embodies Cadillac’s new design identity. It looks damn good doing it, too. Sharp, swept-back headlights and a crest-shaped grille with mesh inserts dominate the front end. In profile, it wears the tell-tale proportions of a front-engined, rear-wheel drive coupe. The back end gets a spoiler on the trunk lid to keep the wheels planted on the ground, and angular tail lamps that pay a discreet tribute to the fin-tailed Cadillacs of yore. We like the crest-shaped insert in the trunk lid; it creates a visual link with the front of the car. Nearly every body panel is specific to the V-badged model. Overall, the sharp-edged ATS-V exudes a tranquil force; it doesn’t need over-the-top wings or black hole-like vents to tell the world what it’s about. The bulge on the hood and the aggressive stance do all the talking. The Cadillac ATS-V hasn’t changed much since it made its debut at the 2014 edition of the Los Angeles Auto Show. It went on sale as a 2016 model, so it’s not quite halfway through its life cycle. Cadillac made tweaks to the infotainment system last year, but both the two- and four-door models are going into the 2018 model year without major modifications. Like most of its rivals, the ATS-V is a mono-spec model. That’s auto industry lingo for a car with no trim levels. The most important choices buyers need to make are selecting a body style and a transmission, which largely come down to personal preferences. Caddy’s smallest model is a serious attempt at building a sports coupe. Highlights from the list of standard features include a push-button ignition, Magnetic Ride Control suspension technology, Brembo brakes, an electronic parking brake, an eight-inch color touch screen with Cadillac’s CUE infotainment system, a Bose sound system, parking sensors on both ends, front bucket seats, leather upholstery, and 18-inch alloy wheels. It’s on par with the competition in terms of features and equipment, though it’s not as tech-savvy as the German coupes in its segment. Cadillac offers no less than seven option packages. Some bring visual add-ons, like the Carbon Black package shown on our tester. The Luxury package bundles navigation, sport pedals, HID headlights, and a universal home remote. The Winter Protection package is for those who don’t plan on driving the car in the winter, while the Track Performance package adds Cadillac’s trick Performance Data Recorder, among other amenities. Note navigation is offered as a standalone option. 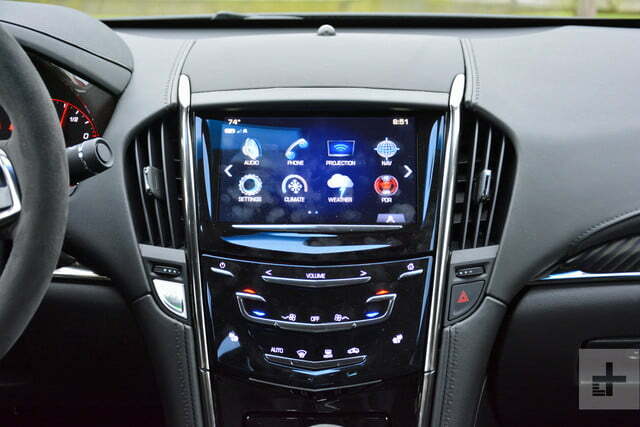 The ATS-V comes equipped with Cadillac’s CUE infotainment system. It’s the standard software found across the automaker’s entire line-up. The icons for the various menus like audio, phone, navigation, and settings are large and clearly labeled, so there’s not much of a learning curve involved in using it. The resolution is adequate, as is the software’s response time. It offers some degree of gesture control: wave your hand in front of the screen and a horizontal menu bar pops up at the bottom of the display. Volkswagen has roughly the same technology in the Golf R. If you don’t like it, or if you yearn for the familiar comfort of your smartphone, rest assured the ATS-V is compatible with both Android Auto and Apple CarPlay. We like the instrument cluster, which is something we find ourselves saying less and less as tech encroaches on the automotive world. The main gauges for speed, engine revolutions, fuel level, and coolant temperature are basic, easy-to-read analog units with white numbers on a black background. Nothing fancy like the epic digital instrument cluster in the Audi RS 5 but nothing too distracting, either. 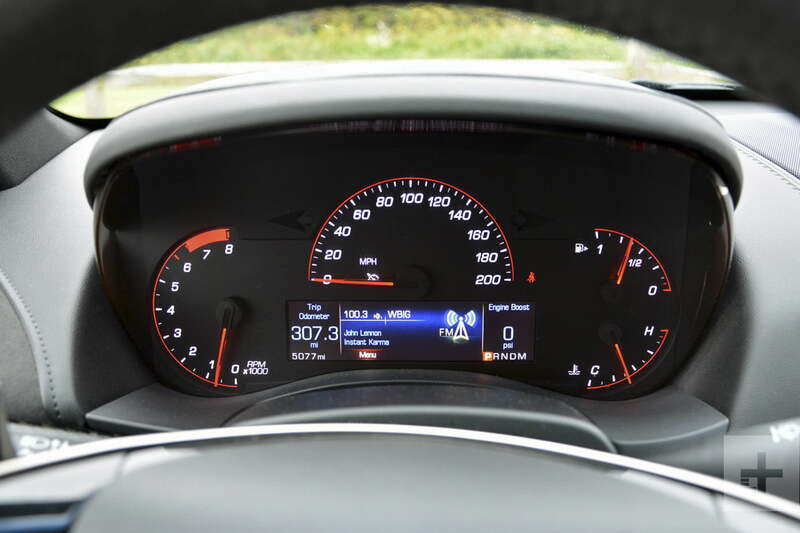 A horizontal color screen right located below the speedometer incorporates the odometer, the trip meter, a boost gauge, and a configurable menu. Our tester comes with the trick Performance Data Recorder also available on Chevrolet’s Corvette and Camaro models. The software records real-time audio, video, and important parameters like the throttle position and the steering angle. We couldn’t find much use for it on the street, though we like the sheer novelty of it. We imagine it becomes a valuable tool on the track. 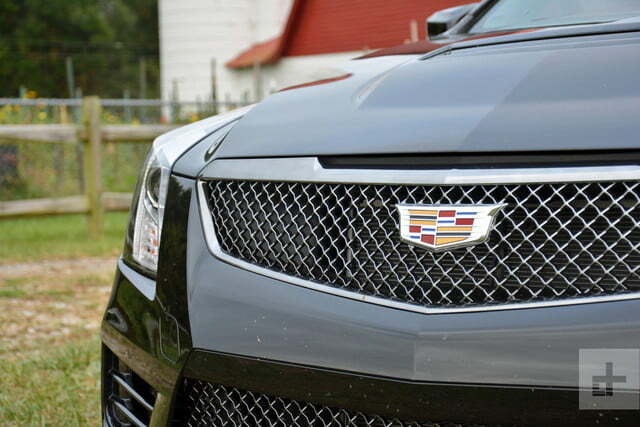 In terms of the driving aids, Cadillac’s smallest performance model is refreshingly basic. 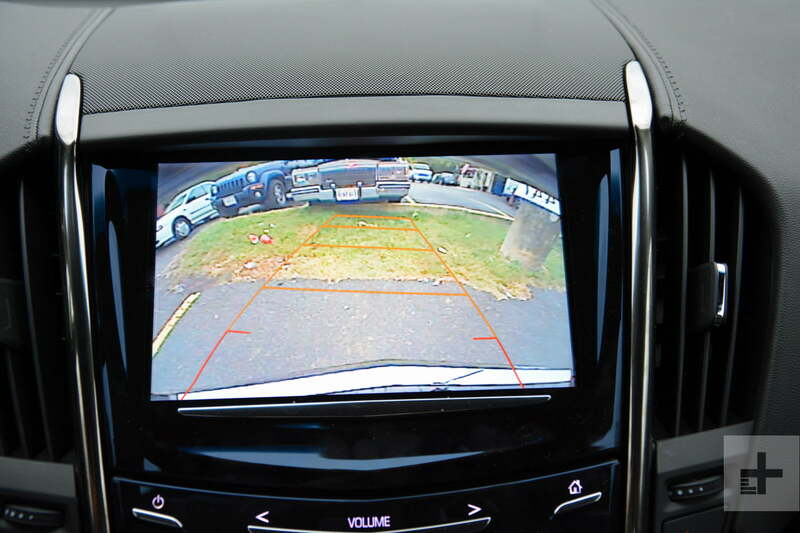 Our tester’s Driver Awareness package adds the usual bouquet of lane change alert, lane-keeping assist, forward collision alert, rear cross traffic alert, and a lane departure warning system. You’re not going to find the company’s Super Cruise tech or any other form of autonomy in this car; its clear mission is to provide the driver with an engaging time behind the wheel, not to harness the collective brainpower of sensors and lasers to morph into a rolling piece of furniture. 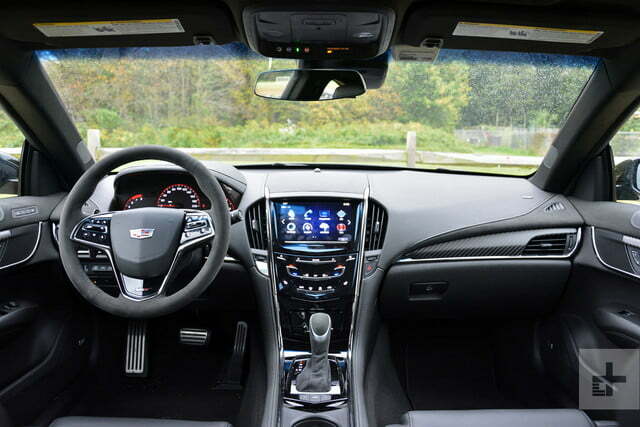 You’ll feel right at home in the ATS-V if you’ve ever sat behind the wheel of the standard ATS. The center console keeps the elegant crest-shaped motif going with about a dozen touch-sensitive buttons that let the front passengers adjust the climate control settings or change the radio station — once they get used to how much input the various functions need to respond. They’re all redundant; you can turn on the seat heaters using the touch screen and crank up the volume with buttons on the steering wheel. 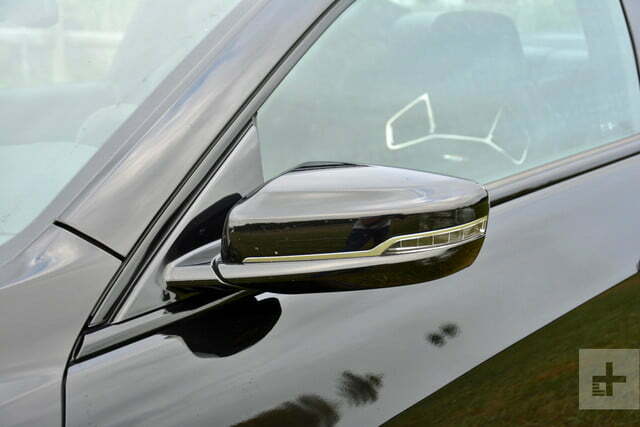 We’re all for progress, but we wish Cadillac had at least kept an old-fashioned volume knob. Its twin-turbocharged V6 is just as bored as you are to do 55 mph on a crowded, overpriced turnpike. The low-key performance theme that influences the exterior design also extends to the interior. 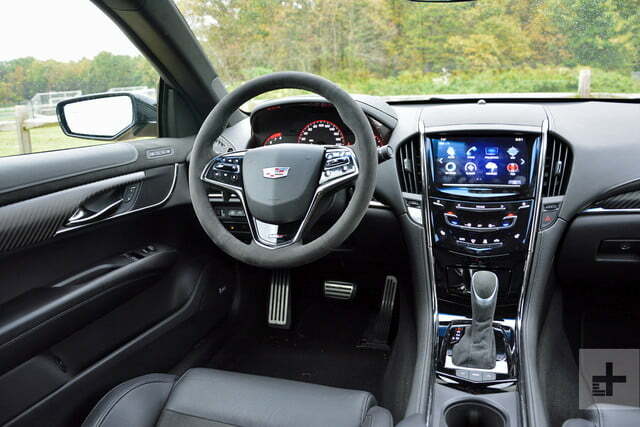 Cadillac added microfiber upholstery on the steering wheel and the gear selector, and carbon fiber inserts on the door panels and the dashboard. The ATS-V is a nice place to sit in. The upper part of the cabin is draped with soft-touch plastics and leather upholstery, though you can find a wide selection of cheaper plastics if you look hard enough. It feels solid overall, like a serious attempt at building a sports coupe. 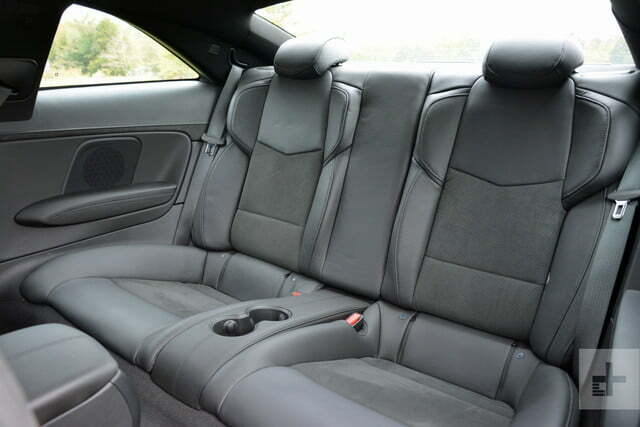 Our car comes equipped with Recaro bucket seats up front, which are part of the aforementioned Carbon Black package. They’re more supportive than the stock sport seats, and they look a lot cooler, but they’re too firm for long road trips. 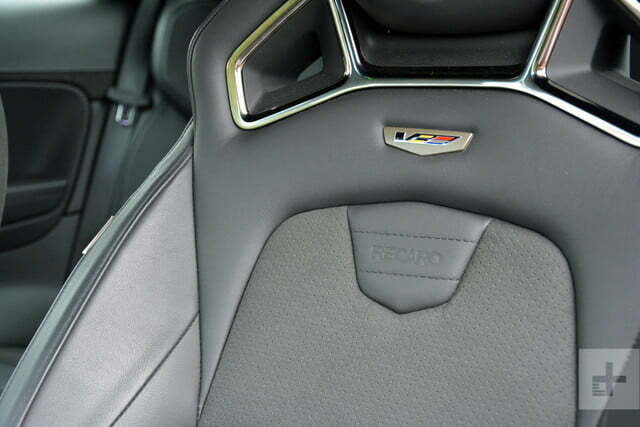 So, while the Recaro seats add a nice sporty touch to the interior that made us feel like we were sitting in the ATS-V.R race car, we don’t recommend them to buyers who want to use the ATS-V as their only form of transportation. Visibility and practicality are both about average for the segment. 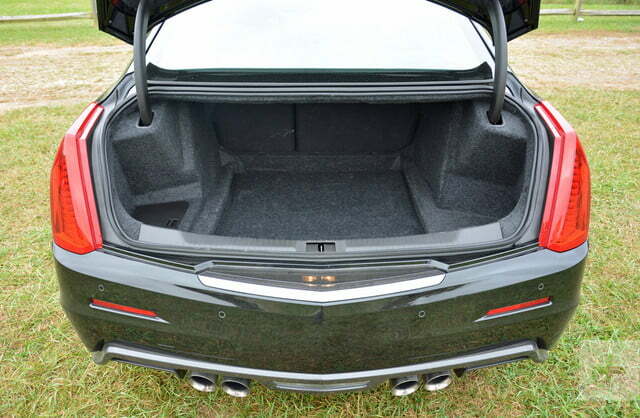 The ATS-V doesn’t excel in either, and at 10.4 cubic feet it has one of the smallest trunks in its competitive set, but we’ll cut it some slack because it’s a proper coupe with two doors. 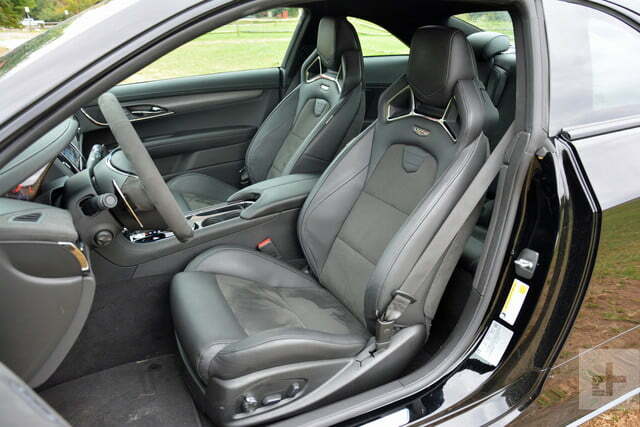 To Cadillac’s credit, the ATS-V comes standard with split-folding rear seats. The rear seats are difficult to get in, and taller passengers will feel like a blue marlin in a fish bowl. The engine comes to life with the kind of growl we like to hear from a six-cylinder, but it quiets down considerably at idle and in normal driving conditions, even though some of its wail gets pumped back into the cabin through the audio system’s speakers. 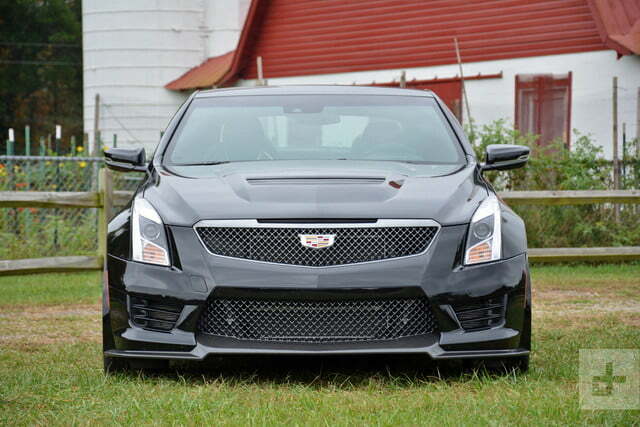 We wouldn’t mind if Cadillac turned up the exhaust by a few decibels and gave it a more menacing growl. On paper, the ATS-V has the right ingredients to run alongside the best athletes sent by European nations to the world cup of performance coupes. 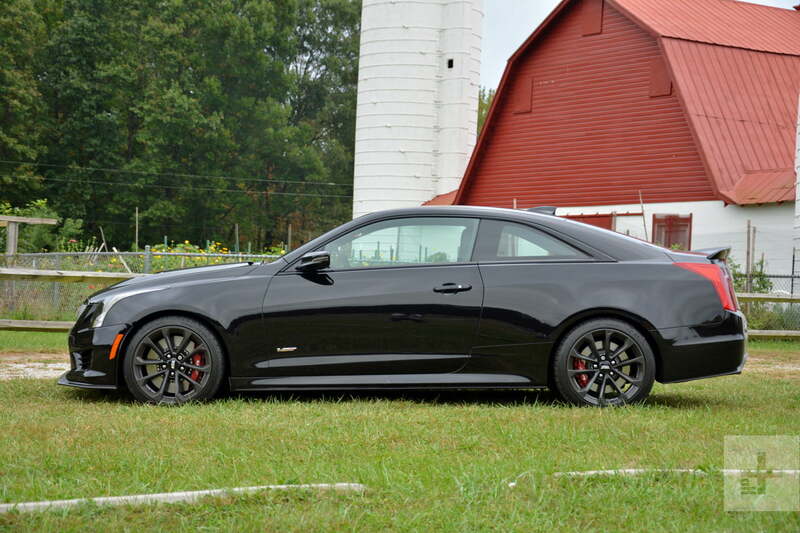 It’s even better in application thanks to its Alpha platform, which also underpins the current Chevrolet Camaro. Lightweight materials like aluminum and high-strength steel keep the coupe’s weight down to a reasonable 3,812 pounds. Add a near-perfect 51/49 weight distribution, plus phenomenally direct steering, and you’ve got one of the most agile, nimble coupes on the market. We placed the ATS-V exactly where we wanted it to go with a flick of the wheel, and turn after turn it obliged without lodging the slightest complaint. Grip is part of what makes this car a real American all-star. We attribute that to the excellent chassis, and to the Michelin Pilot Super Sport tires. The magnetic suspension keeps body roll in check at the expense of ride quality, which we can best describe as firm even with the softer of the four driving modes engaged. Brembo brakes bring the action to a stop with zero fuss and very little fade. The ATS-V carves corners with the energetic finesse of a punk rocker in a Hugo Boss suit. The ATS-V carves corners with the energetic finesse of a punk rocker in a Hugo Boss suit. It drives like a rear-wheel drive sports car should; it’s the kind of playful, tail-happy coupe you can place sideways with relative ease. Mind the fine-print about professional driver, closed course, etc. You can experience it for yourself without losing your license, thankfully, because every new ATS-V comes with a complimentary two-day stint at Cadillac’s own performance training center. We noted a perceptible amount of turbo lag, so there’s a slight pause before the V6 shreds the rear tires to atoms. Acceleration is brisk, the eight-speed goes through the gears with meteoric quickness, and the coupe feels unstoppable once it gets up to freeway speeds. You see, this whole corner-carving thing is relatively new to Cadillac, though the company mastered it in a short amount of time. 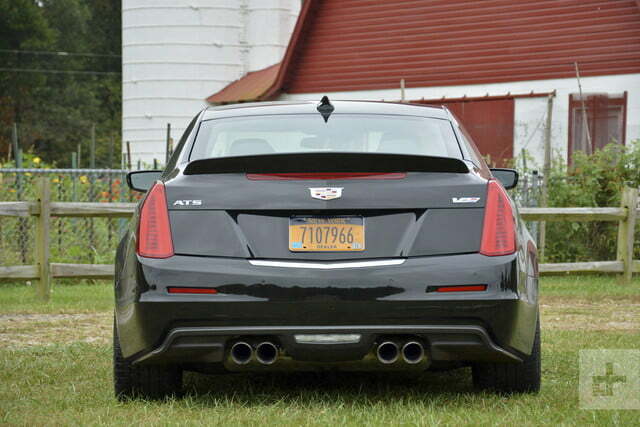 What’s not is the ability to eat up miles for hours on end, and the ATS-V doesn’t disappoint in that regard, either. This is a car that wants to run. It’s just as bored as you are doing 55 mph on a crowded, overpriced turnpike riddled with potholes big enough to boil a lobster in. The twin-turbocharged six-cylinder develops quite a thirst as it exercises. The Environmental Protection Agency (EPA) rates it at 17 mpg in the city, 25 mpg on the highway, and 20 mpg in a combined cycle. That’s about on par with its three main rivals: the C63, the M4, and the RS 5. Our trip in the ATS-V took us from downtown New York City to Washington D.C., via Philadelphia for a delicious steak and cheese sandwich (how could we not?). That’s a healthy mix of highway and city driving, and we observed approximately 18 mpg with two people and four suitcases on board. We imagine we would have seen a lower figure had we been able to stretch the Caddy’s legs out in the Nevada desert. Efficient it is not, but if that’s your main priority there’s a Toyota called Prius with your name on it. The Cadillac ATS-V comes standard with front airbags, side airbags for both rows of seats, and knee airbags for the front passengers. It also comes standard with a rear-view camera (a feature that will soon be mandatory on all new cars), a teen driver mode, electronic stability control, and General Motors’ OnStar technology, which brings automatic crash response. Driving aids like lane-keeping assist, a lane departure warning system, and forward collision warning are bundled into a $595 option package. The Insurance Institute of Highway Safety (IIHS) gave the four-door, non-V ATS a superior rating for collision avoidance and mitigation, though the headlights received a “poor” rating. The same model earned a five-star safety rating from the National Highway Traffic Safety Administration (NHTSA), meaning it’s one of the safer cars on the market. Neither agency has evaluated the two-door ATS-V tested here, and we certainly weren’t about to do it for them. If we were in the market for an ATS-V, we’d start with the coupe, because it boasts a more striking silhouette than the sedan. Our commute doesn’t involve any type of city driving, so we’d get the six-speed manual transmission, which we suspect is a more enjoyable to drive on back roads than the eight-speed automatic. Make ours phantom gray metallic with 18-inch dark-finished alloy wheels for a low-key look. We’d skip the Recaro seats, we’d skip the head-up display — we’ve already got enough information in front of us — but we’d add navigation and the Track Performance Package. A true driver’s car in every sense of the term, the Cadillac ATS-V is the most underrated model in the compact performance car segment. A lot of it comes down to the badge. Cadillac’s doesn’t carry the same amount of cachet as, say, a three-pointed star, four rings, or a blue and white roundel. If you’re willing to look beyond that, and you should, the ATS-V will reward you with a memorable driving experience that will send you looking for any excuse to take it out for a spin. 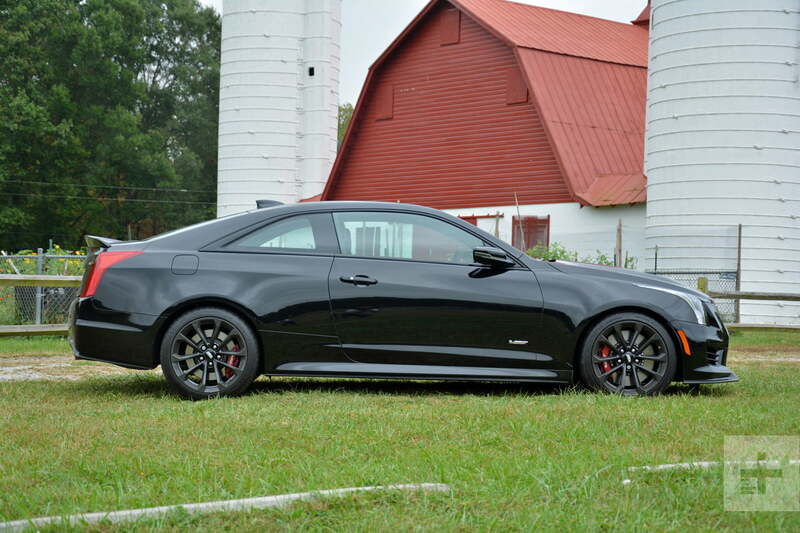 The Cadillac ATS-V Coupe competes in a crowded segment of the market dominated by Europeans. Prospective buyers can also test drive the Mercedes-AMG C63, the Audi RS 5, and the BMW M4. Those who aren’t set on getting a coupe should also consider the Alfa Romeo Giulia Quadrifoglio, which trumps its rivals with 505 hp. 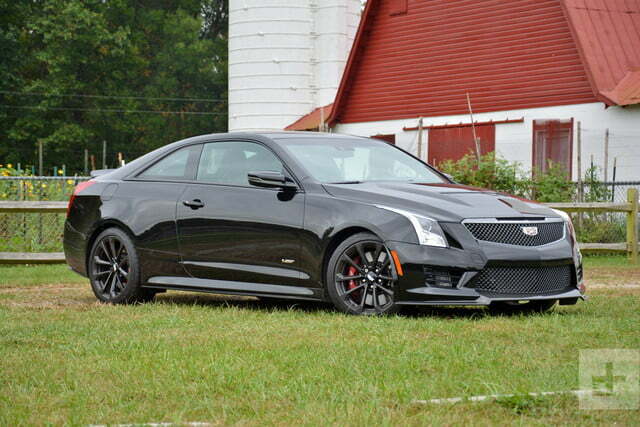 The ATS-V feels more like an old-school performance car than the C63 and the M4. It’s not as refined or as luxurious, but it’s rawer, and offers a more visceral driving experience with a devil-may-care attitude. It’s more playful than an RS 5 thanks to its rear-wheel drive layout, though that comes at the obvious expense of traction. There are plenty of alternatives to the Caddy but they’re not necessarily better or worse; they each have their own distinct personality. 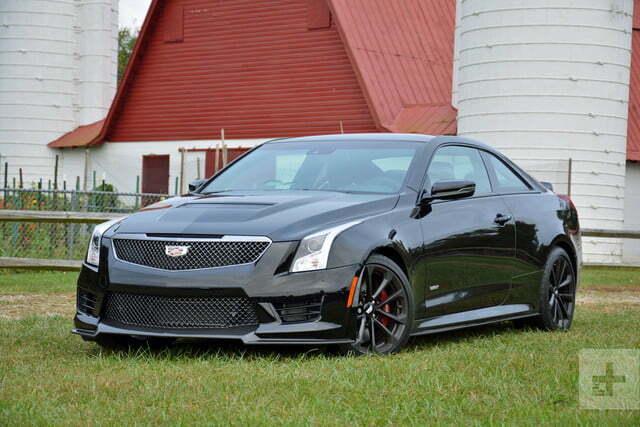 What matters is the ATS-V holds its own against the competition. The ATS-V comes with a six-year, 70,000-mile powertrain warranty and a four-year, 50,000-mile bumper-to-bumper warranty. It’s based on a well-known platform and it uses proven mechanical components. There’s little left to chance, so we predict it will age well even well after the last examples leave showrooms. The Cadillac ATS-V gushes with character and charisma, which are difficult to measure with numbers but hugely important behind the wheel of a performance car. It’s not the most practical or efficient sports coupe on the market, but if you can live with that it deserves a spot in your garage.